Rice grower Chris Isbell (left) and ARS' Bob Dilday check a field of Akita Komachi rice. The big tour buses rumble 2 miles up Highway 13 from the Arkansas hamlet of Humnoke and squeeze onto a small strip of paved road that disappears to the left. At the end of the pavement, they disgorge tourists who stand in awe, cameras in hand, gazing at something they were taught as children in Japan that they would never, ever see: Japanese rice plants nodding their golden grained heads, not on neat green swaths of Japanese soil, but in an American rice field. 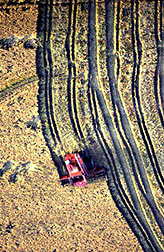 The laser-leveled rice fields belong to Leroy and Chris Isbell, forerunners of a future trend—Arkansas rice farmers gearing up to grow Japanese rice varieties for the tantalizing Japanese market, available to outsiders only since the signing of the international General Agreement on Tariffs and Trade in 1994. "Before the signing of GATT, Japan had a ban on imports of rice," explains John C. Shifflett, vice president of marketing for the rice division of Riceland Foods, Inc., a 10,000-member, farmer-owned marketing cooperative based at Stuttgart, Arkansas. "As a result of GATT, Japan will now import rice. It started with 379,000 metric tons in 1995, and that total will rise to 758,000 metric tons by the year 2000." Arkansas rice farmers want a slice of that pie. They already produce more than 4 of every 10 pounds of the U.S. rice crop, which weighed in at about 17.4 billion pounds in 1995, with a value of $1.5 billion. But there's a catch: American rice, sold all over the world, isn't a big hit in Japan. Just as the English are connoisseurs of their teas and the French are meticulous about their sauces and wines, Japanese consumers want rice to taste a certain way—and U.S. rice varieties often don't fill the culinary bill. At the ARS National Rice Germplasm Evaluation and Enhancement Center at Stuttgart, geneticist Robert H. Dilday recognized this distinction. In the late 1980’s, he and Ronnie Helms, then an agronomist with the University of Arkansas, began combing the USDA-ARS rice germplasm collection for Japanese varieties that might be a hit with both Southern rice farmers and Japanese consumers. They pinpointed 800 rices from Japan in the germplasm collection’s more than 16,000 accessions and grew every one in test plots at Stuttgart in 1989. 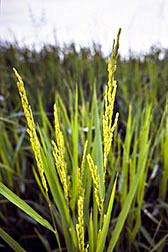 Each rice was evaluated for traits such as grain type; the length of time required from plant emergence to topping of the plant’s head with grain, called heading; and the likelihood of lodging--an undesirable tendency for the plant stalk to bend or break under the weight of the grain and slump to the ground, making harvesting difficult. From the pool of 800, Dilday and Helms focused their attention on the top 120 performers, scrutinizing those more closely in field tests in 1991 and 1992. "We found Japanese germplasm that matures very early, going from emergence to heading in just 44 days," Dilday notes. "The early-maturing commercial varieties we grow here in Arkansas typically take 75 to 85 days from emergence to heading. "We also found that fertilizer applications can affect yield and tendency to lodge. In Japan, the plants are "spoon-fed" fertilizer in five or six applications during the growing season. Here in Arkansas, we typically put half the fertilizer on before we flood the fields, then the rest in two applications during the growing season." 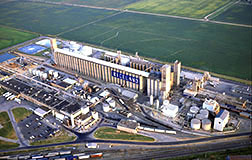 This Riceland Foods, Inc., rice and soybean storage and processing facility is near Stuttgart, Arkansas. Riceland is a 10,000-member cooperative started in 1921, with Bob Dilday’s grandfather as one of the founding members. The downside for Japan 92.09.31 is the taste, which is unacceptable to the Japanese palate, Dilday says. And it’s not sticky when cooked, like the Japanese want,” he notes. “But these tests did show that germplasm from Japan could produce high yields in the South. About the same time, Chris Isbell was coming to the same exciting conclusion. 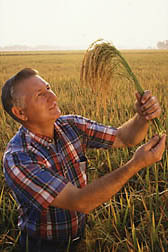 Plant geneticist Bob Dilday inspects a Japanese rice variety that is quick to mature. It can be planted after wheat in early June, thus providing the farmer with two cash crops in a year. 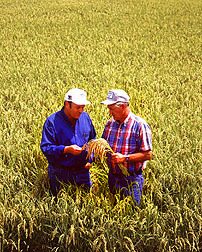 Isbell and Dilday had conducted a running discussion on the potential for Japanese rice in Arkansas since the two men first met in 1988. Ironically, even though Isbell and Dilday live only about 20 miles apart back in Arkansas, their first encounter was at a scientific meeting on rice held at the University of California at Davis. "Chris and I stayed in the same dormitory at that meeting, and we started talking about Japanese rice over a game of Ping-Pong," Dilday recalls. "He knew I was working with the USDA rice germplasm collection, and I knew there were some Japanese rice cultivars in that collection." Isbell's interest had already been sparked by a conversation with Shoichi Ito, a Japanese rice economist who'd been studying the feasibility of growing Japanese rice varieties worldwide. Inspired by the information he'd garnered from Ito and Dilday, Isbell planted his first Japanese rice in Humnoke in 1990. "I started by planting just a few pounds of the Japanese variety Koshihikari," says Isbell. "We didn't know where we'd sell it or if we could produce the same quality as growers in Japan. We began learning that first year." With the doors to the Japanese market still firmly closed in those pre-GATT days, Isbell linked with the Nishimoto Trading Co. of Los Angeles, California, to market his rice in Los Angeles, San Francisco, New York, and Chicago. When GATT made the Japanese market available, Isbell's rice went there, marketed as "Chris's Rice" in a package adorned with a picture of the farming Isbell family, via the Itochu Trading Co. of Japan. Grower David Jessup (left) discusses his irrigation system with Riceland Foods’ dryer manager Lenneth Pfaffenberger. A tractor-mounted pump delivers 2,000 gallons per minute to this rice field as it is being flooded to control weeds. "I stopped counting the interviews I've done at 50, mostly for Japanese TV," Isbell says. "We've had at least two dozen bus tours here at the farm; I've had Greyhound buses driving down the levees in our rice fields. And NHK, the public television network in Japan, sent a film crew here seven or eight times and ran an hour-and-a-half documentary in Japan on our whole family." 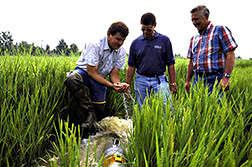 Encouraged by Isbell and Dilday, Riceland Foods called together a handful of Arkansas rice farmers in the spring of 1996 to sound out their interest and willingness to try growing the Japanese varieties. "We wanted 10 growers to try about 6 to 10 acres apiece," says Riceland's Shifflett. "But because it was so late in the growing season, we wound up with three growers and a total of about 60 acres of the Japanese rice." The seed planted by Arkansas growers Carlos Carter of Stuttgart, Frank Lisko of Slovak, and David Jessup of DeWitt, came from Chris Isbell. Although his own farm features 400 acres of the Japanese consumer's favorite, Koshihikari, and 200 acres of another popular variety called Akita Komachi, Isbell says the Japanese varieties pose enough production challenges that he suggested the newcomers try their hand at Akita Komachi, reportedly less troublesome to grow. Frank Lisko, who grows rice, corn, wheat, and soybeans near Slovak, agrees that growing the Japanese rice was a different experience. "You use a lot less fertilizer," says Lisko. "The Japanese don't like bitter rice, and the higher nitrogen fertilizer applications cause the protein levels to go up in the rice and can make the rice taste bitter to them. "The crop had good germination, grew well, and then—it headed out and lay down," he adds. "Because of the lodging, it was really hard to harvest. Also, it's tough to strip the rice off the plant head because the straw stays green longer and doesn't dry down. Typically, you can harvest 40 acres in a day or a day and a half. It took us 4 full days. " Lodging was also a problem on the 13 acres of Akita Komachi at Carlos Carter's Lost Island Farm at Stuttgart. But Carter says new-style harvesting equipment will alleviate many of those woes. “Our initial experience was good,” Carter recalls. “The Japanese rice is very compatible with the way we raise rice here. Drying costs will be a little more because the Japanese like the rice harvested with 22 percent moisture, and we normally harvest at 17 to 18 percent moisture. But our nitrogen costs are lower on this rice. "The Japanese varieties would be a diversification and could open up a whole new market," he says. "This is probably icing on the cake for us." Harvesting a Japanese rice variety near Stuttgart, Arkansas. Riceland’s Shifflett agrees that the Arkansas growers are more likely to secure a niche in the Japanese market than to snare a major share of U.S. rice sales to Japan. "The Japanese don't like the southern medium-grain rice as much as they do medium-grain rice grown in California," he explains. "When Japan first started importing rice, most of what it bought from the United States came from California, where they're also growing some Japanese varieties. "Under the GATT Minimum Access Program, the Japanese in 1995 had to import 379,000 metric tons of rice," Shifflett continues. "They bought 369,000 metric tons under "minimum access" and another 10,000 metric tons under "specialty rice." They won't buy the southern medium-grain rice under minimum access, so our best shot is to sell them specialty rice." Down the road, at ARS' National Rice Germplasm Evaluation and Enhancement Center, Dilday is working to improve the odds for southern rice in Japan. "In 1994, we obtained 70 new Japanese varieties that we did not have in our rice germplasm collection before," he says. "Some of these came directly from Japan, and others were acquired through Dr. Kent McKenzie, who is with the California Rice Experiment Station at Biggs. “We’ve evaluated them in the field and conducted taste tests in Japan on some of the rices we grew. In the taste tests, the Japanese liked Jouiku 394 best, which was the highest yielding variety in the earliest Japanese maturity group, maturing at 56 days. We’ve shown that Japanese varieties and germplasm will grow well in Arkansas, and some of them appear to have better yields than our U.S. varieties. "We plan to meet and discuss our research results with Riceland Foods after we analyze our 1996 data. I don't believe the southern rice farmers will totally convert to the production of Japanese rice varieties, but this will provide them with a nice niche market in the future." --By Sandy Miller Hays, ARS. Rice paddies are ideal growing grounds for rice, except for one problem: They form sulfides that make soil zinc unavailable to the growing rice plants. Although some rice varieties tolerate this better than others, yield loss to zinc deficiency is estimated to cost U.S. farmers millions of dollars each year. ARS agronomist Rufus Chaney, a heavy metals expert, cooperated with Horst Marschner, of the Hohenheim University Institute of Plant Nutrition in Germany, and Xiaoe Yang, a visiting scientist from China, to develop an accurate test to help breeders select plants with genes for greater tolerance to zinc shortfall. “Rice suffers from zinc deficiency in this country and abroad—including China, India, Japan, and the Philippines—even though the soils contain adequate zinc for other crops,” Chaney says. In Chaney’s test, rice seedlings grow in a special nutrient solution that lowers zinc availability, while providing all other nutrients needed for normal growth. A chelating agent in the solution binds zinc so strongly that only plants with resistance to zinc deficiency can still grow. By supplying all needed nutrients except the one being tested for, the solution avoids the risk of creating a deficiency of another nutrient that could cause confusing results. In the new test, obvious symptoms of zinc deficiency show up in 8 days. In the worst cases, new leaves fail to grow, and old ones become dark green and reddish brown. In plants with slightly less severe deficiencies, new leaves grow slowly, with white stripes running down the middle of the leaves—a typical sign seen in rice paddies. The roots of zinc-deficient plants also became longer and finer in both the new test and in an older one. When adequate zinc was supplied, the plants grew normally. Chaney says Yang has returned to China and grown many rice types in paddies to check the lab screening results. She found the lab test’s predictions to be accurate. -- By Don Comis, ARS. Rufus Chaney is at the USDA-ARS Animal Manure & By-Products Laboratory, Beltsville, MD; phone (301) 504-8324 ext. 447.